Several different projections are used for globular representatons of the earth, orthographic, stereographic, and gnomic. In all three the lines of both the meridians and parallels may be curved. On this page the first three stamps show an "equatorial" projection, while the Cuban stamp is an "oblique" projection. These are perspective projections which show the earth as though from a distant point in space. In general, they are neither conformal nor equal area. The Australian stamp was issued in 1981 to mark the 50th annivesary of the first official air mail in Australia in 1931. The Chilean stamp was issued in 1992 to mark the 500th anniversary of the discovery of the Western Hemisphere. In 1961 Cuba issued the stamp to mark the 10th anniversary of Cuban International Broadcast Service. 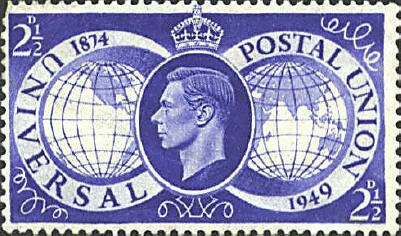 The 75th anniversary of the Universal Postal Union was recognized by Great Britain's issue of this stamp.